Stream anime episodes online for free, Watch One piece Episode 1 English version online and free episodes. Anime Episode guide One piece Episode 1 English dubbed I’m Luffy! The Man Who’s Gonna Be King of the Pirates! The pirate ship of Captain Alvida attacks a cruise ship. Coby, a young child who is an essentially a slave of Alvida, sneaks into the kitchen and rolls a barrel away. One of the pirates attempts to smash open the barrel with his fist,when Luffy emerges and accidentally hits him. The remaining pirates attack him, but are defeated and run off. 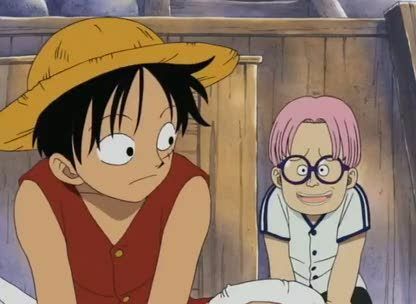 Luffy drags Coby to the storage cellar of the ship, where he eats and converses with Coby, who reveils his dream of being a marine. Meanwhile, Alvida’s pirates tell their captain of their encounter with Luffy. 4.8 / 5 - 177 ratings.